On Thursday, New York City Mayor Michael Bloomberg announced that Occupy Wall Street protesters would have to vacate Zuccotti Park, their place of occupation, so the park could be cleaned. After that, they would not be permitted to re-enter the park with sleeping bags, tents or other necessary occupation supplies. The Occupiers refused to move, delaying their eviction. They suspected a trap: after all, having watched Boston police swarm protesters in riot gear and drive them out with all the subtlety of Hungary in '56, the smart play for Bloomberg and the NYPD would be to lure the protesters out, then keep them locked out. A decidedly non-aggressive tactic such as that would provide few stirring images of victimization. Then, in the streets, protesters on the move could be arrested, as they have been for weeks. People who want to get into the validity of the comparison are welcome to do so in the comments section. Clearly, iPhone fans aren't in a park, but not being in a park has presented the surest way for protesters to be arrested, on the subjective pretext of disturbance. And while sidewalks are public places and Zuccotti park is privately owned, the stated purpose of building it according to its owners, Brookfield Properties, was to provide the public with a public area in which to gather. 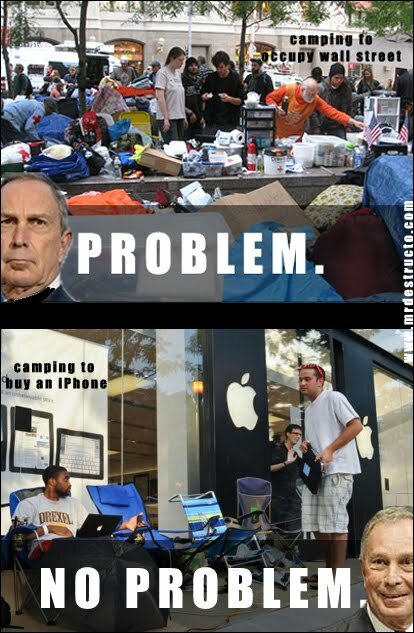 Occupy Wall Streeters have only put it to optimal use. Of course, the most obvious distinction here is that one form of gathering provides public shame for billion-dollar corporations, while another shows slavish, pointless, self-sacrificing devotion to a billion-dollar corporation. If Mayor Bloomberg had some sort of ties to billion-dollar corporations and the interests of their owners, there might be a link here.